IBV presents at the SPS IPC Drives 2017 in Nuremberg a software solution for the implementation of the Ethernet POWERLINK communication protocol running on the real-time operating system QNX for the first time. The communication stack is based on the open source package "openPOWERLINK" which guarantees the compatibility to the POWERLINK standard. Managing Nodes (MN) as well as Controlled Nodes (CN) can be implemented with the stack. The hardware architectures x86 and ARM are supported under QNX. The Ethernet communication can be performed with help of the QNX network driver for standard applications. As an option, IBV provides optimized link layer drivers (e. g. for TI Sitara) to achieve shorter cycle times and lower CPU load. Besides the POWERLINK communication, TCP/IP traffic can be transferred over the same Ethernet network. For this the stack provides a virtual Ethernet interface in the QNX network stack. The data is transmitted in the asynchronous phase of the POWERLINK cycle without influencing the real-time communication. The roadmap for the product contains an optimized link layer driver for the Intel i210 network chip as well as the support of the Linux real-time extension Xenomai. 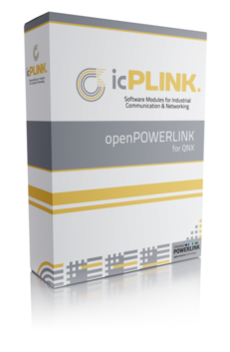 The source code of icPLINK openPOWERLINK for QNX can be licensed for a one-time fee. One day of integration support is contained helping to speed up getting started with the product. As a competent partner for software development and real-time operating systems, IBV provides "all-in-one" services for embedded projects. IBV provides software engineering services for development (drivers, board support packages and applications) as well as integration, support and consulting. IBV is a member of the Ethernet POWERLINK Standardization Group (EPSG). openPOWERLINK for QNX can be seen live at the SPS IPC Drives 2017 at booth 2-400 of IBV as well as at booth 2-458 of the Ethernet POWERLINK Standardization Group. Please ask for a demonstration!